You don't think that petition for Tebow will work, do you? The NFL is a quarterback-driven league, with historic names like Brady, Manning(Both of 'em), Rodgers, Roethlisberger and Brees capturing nine of the last 10 Super Bowls. Oh, and I guess last year's winner Joe Flacco ain't too shabby either. The point is, to play a good football at the NFL level, you need high-level quarterback play. None of these teams have that luxury. So, without further ado, here is a look at the quarterback battles that will be entertaining for all the wrong reasons. Things have been rough on the Bills ever since Hall of Fame quarterback Jim Kelly hung up his cleats in 1996. Don't expect them to get much better, as Jackson and his career 78 career QB rating looks like the leader to win this job. Still, he's a better choice than Kolb, who brings an equally mediocre resume with less athleticism. The most intriguing option is first round pick E.J. Manuel out of Florida State. The Bills selecting the former Seminole was a head-scratcher to nearly everyone watching the draft, but he does have the best combination of size and athleticism of anybody in this group. His arm? That's up for debate. The Browns are far from confident in Weeden after a rookie season that saw him throw only 14 TDs to 17 INTs and complete less than 60 percent of his passes. Making matters worse is that the 2012 first round pick will turn 30 in October, effectively making him a veteran with no real experience or credentials. Oh yeah, and RGIII, Andrew Luck and Russell Wilson all look like franchise quarterbacks. Bad year to be a crappy rookie QB. Jason Campbell was pretty bad filling in for Jay Cutler in Chicago last year, but his previous four seasons in Washington and Oakland were actually not too bad. If he regains his form, the 31-year old Campbell (First round pick in 2005 and only a year older than Weeden) could snag the job. Jacksonville Jaguars: Blaine Gabbert vs Chad Henne vs Jordan Rodgers vs Denard Robinson vs Tim Tebow?? 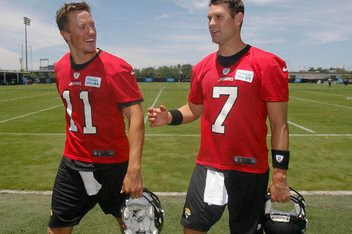 Henne and Gabbert both threw for a ton of yards in losses last year, so if you're looking for a viable late-season fantasy starter, I wouldn't overlook these two. But, if you want someone to actually win football games with, you may want to look elsewhere. The Jags drafted Aaron Rodgers' younger brother Jordan out of Vanderbilt, so maybe elite QB play runs in his blood? Probably not, but they also snagged Robinson out of Michigan with the plan of using him as a receiver. Reports already have the diminutive but explosive Robinson lining up at QB for the Jags, but if they're going to run a "Wildcat" offense, shouldn't they just give poor Tim Tebow a job? Jaguar fans even started a petition. The Raiders took strong-armed Wilson in the fourth-round, and started the clock on the uber-talented but troubled Pryor. Matt Flynn is still wondering why he isn't the starter in Seattle, but at least he has a solid NFL game under his belt. Man, this is pretty bad. Sanchez has gone from serviceable to abominable in a hurry, and Smith lost five in a row last season in a conference where they don't play defense. McElroy did step in for the Jets when Sanchez was out last year (Over Teboow), so maybe he gets a shot too. Making matters even worse is the dearth of talent on the offensive side of the ball for New York. Whoever wins this job won't have many weapons to utilize, and will likely have to put up points as the Jets rebuild on defense as well.